Eating is a dynamic sensorial cascade during which multiple interactions occur between a food and the animal. With different sensory equipment and anatomy, cats and dogs don’t behave the same when facing food. 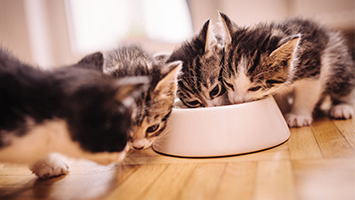 Like humans, cats and dogs have their own feeding behaviors. On close observation, it’s easy to see that their way of eating is not the same. And this difference starts right from the food selection step. 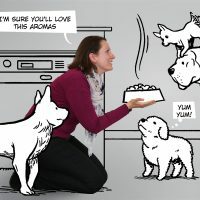 If dogs sniff, choose and eat food rapidly, generally sticking to their first choice, cats tend to hesitate, take time before eating, and change their mind several times when facing various foods. Food prehension and mastication is also different between cats and dogs, especially with dry pet food. Dogs usually pick up kibbles with their teeth and swallow them directly or after having ground them. Cats can take kibbles with their tongue, teeth or lips. They either swallow directly or roll them with their tongue toward their molars to break them in small pieces. To understand these behavioral differences you need to dig into anatomical and sensorial fields. Feeding behavior mostly results from the interaction between organoleptic properties of food and pet sensorial equipment. Odor, color, texture, shape, taste… at each step of the meal, different food attributes stimulate different pets’ organs and senses. And here is the variation! From number of taste buds to number of teeth, cats and dogs are not the same. Their differences in sensory acuity and anatomy cause them to behave differently with food. With 10 percent of their brain dedicated to olfaction, dogs have, for instance, a strong sense of smell. It is thus not surprising that they sniff a lot and trust their nose to select food. One of the ways cats differ from dogs is that their jaws are limited to vertical movement. That’s probably why they do not grind but shear and break kibbles. Knowing physiology and understanding feeding behavior is a first step to tailoring food to the specific needs of cats and dogs. The logical continuation to satisfy their appetites is to know their preferences and make sure that food possesses all the attributes that will bring palatability. Great article with fantastic infographic! Looking forward to seeing information related to wet petfood! 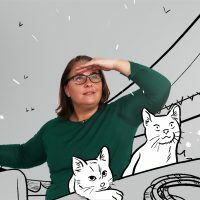 Your comment will be moderated by Diana Pet Food team before publication. Visit About the blog to learn more about the comments rules. SPF reinvents pet food palatability to enhance pets' sensorial experience and make mealtime a shared happy moment. The way in which palatability enhancers are applied to kibbles is key. From dosage to mixing, discover handy tips to make the most of palatant potential.